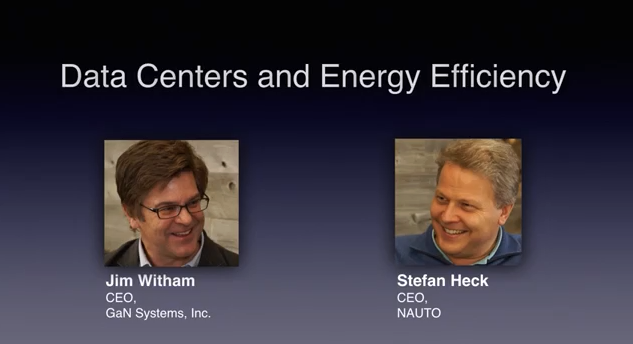 In this episode of ‘The Conversation,’ Jim Witham, CEO of GaN Systems (a leading GaN power semiconductor company) joins Stefan Heck, CEO of NAUTO (an autonomous vehicle technology company using an artificial intelligence-powered connected camera network.) The topic: As the flow of data continues to grow exponentially and the data center becomes a cornerstone of the global economy, how do data center executives need to think more expansively about power efficiency? With global data center use of energy tracking to reach 5-10% of world-wide consumption in a few years, how do we ensure that the better world we seek to create through data is not offset by the data centers’ insatiable demands for energy? There’s a tremendous amount of opportunity for change in data centers – especially around power efficiency. 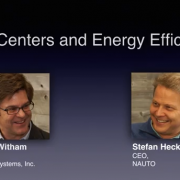 The number one expense in data centers is the energy to run the servers. It can be as much as 40% of total cost. Those servers typically waste about 5-10% of that energy. With new power semiconductors, they would be able to cut those losses to maybe a percent or two, save a lot of energy, and tremendous amounts of money for the data center. I’ve been amazed that with data centers you pay for the energy twice. On the in-bound side you pay to power the servers, and then for the AC to cool then. That’s a double whammy. Like in the auto industry where you can make the electronics smaller, if you can make the server power supplies smaller, you can use less space for power conversion and put more servers in the same space. If you put more servers in the same space that means that you’re using your assets better. For a data center manager, they’re getting more TB/square meter. And with 10X growth we’ve been seeing in data centers, you could also delay actually spending money to build new data center. Data centers are similar to the auto industry in that there are multiple steps in power conversion. The incoming high voltage power is converted 3 times before it gets to an actual server at the 3 or 5 volt level. Exactly. You’re going from very high voltage AC down to a volt in electrons for the microprocessors. And you don’t want to throw those away. Here’s an example of what can be done around power efficiency and density in data centers. It’s exciting when you’re talking about power electronics and the kind of productivity shift available either because the system is more efficient, or smaller in size. You get more use out of it, and that’s a double win. It adds to the bottom, but at the same time you’re reducing energy, reducing materials, and reducing your environmental footprint. So the bottom line and the environment are longer at odds. They go hand in hand in this case. Efficiency in saving energy and improving power electronics is a great win that way. We’ve talked a lot about technology and about how hardware and software can change things. I think another important element of this equation is people. We’ve got to get data center executives to change their mindset, and change their thinking in order to not only change their business, but change the world. I agree. A lot of these system changes that can come from the new power architecture means that executives have to rethink what service their data center is providing. Business leaders have to get involved in a whole new way of doing business. It isn’t just about incremental engineering change that’s going to happen automatically down in their procurement department or their engineering organization. We’re talking about fundamental change here and that needs to get down to the C-Suite. People have to show the leadership here’s some new ideas make sense; these can fundamentally change the business. Then they have to organize the teams to make sure it happens. It’s about taking some risks and chances. It’s about doing some pilots and field trials. Then get to work on it to show what can be done. That’s right. I think both you and I are working with industries – data centers and in automotive – that have a lot of expertise and have been successful for a long time. But they are facing disruption and need to revisit what product they’re offering. They need to question how they’re building it, how they’re designing it. Look closely at these disruptive power technologies. Because sometimes it isn’t just a 10% improvement; It’s a 50% step change. And that means you’ve got to rethink your architecture. Exactly. Not an easy job, but one that has a lot of benefits if the company does it right. Huge return . And frankly if you miss it – There’s huge risk, if you fall behind. You have to look forward and embrace change. There’s a lot of good about it, but it does take leadership as you said. Excellent. Thanks for the discussion Stefan. Sure, my pleasure. Great to talk to you.